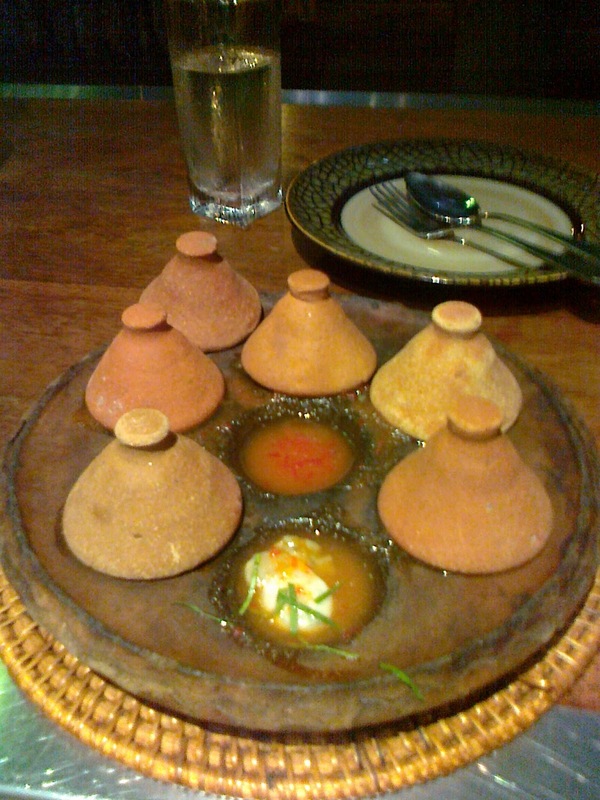 I went to the best restaurant in Darwin, Hanuman, last night. Their food is Thai Nonya (Nonya is a mixture of Malay and Chinese styles of food). I went with my parents and a family friend visiting from McLaren Vale, South Australia. We ate early as that was the preference of the company I had. The service was very good, just the right amount of friendly. Very professional. The waiter repeated our order back to us to ensure all was correct and was knowledgeable about both the food and wine lists. There were some attempts at upselling naan bread and sparkling mineral water. Nicely done, but declined in favour of filling up on the other dishes and drinking wine and the delicious Hanuman iced tea mocktail (they make the syrup, mainly lemon grass and ginger, in-house and top it with soda). I started with the oysters, I really wanted our friend to experience them. 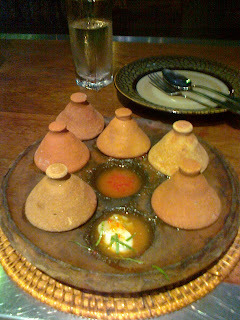 For those who haven't tried them yet, they come served on an oven-hot clay dish with depressions in it that hold 1 oyster each. The oysters are lightly poached in the sauce that fills the depression with them. The sauce is a wonderful blend of chilli, lemon grass, ginger and thai basil - aromatic, not too spicy and above all, doesn't mask the flavour of the small, tasty oysters in it. No wonder it is their signature dish! For the mains we had the pork belly Chinese style, thick and tender slices in a star anise sauce with asian greens. We also had an old favourite, the butter chicken. You know they have a proper tandoor oven out there in the kitchen as the chicken has been marinated in tandoori spices, cooked on a skewer in the tandoor oven and then put in the smooth tomato, cream and cashew sauce. The third main we shared was the red curry duck. The sauce was fabulous, but the duck was a little chewy. the lighting's nice but the acoustics aren't so good - when it's busy it's LOUD. It can also be a little on the chilly side when dining inside. I love that you don't get matching plates, they are all beautiful and all different. I also like the distinctive cutlery. a good range, including some older vintages and more expensive wines; and a bit of each variety by the glass. Because it's close, it's so easy to visit. Each time I go the experience is different! Perhaps the thing I really want for dining in Darwin is CONSISTENCY. I only had a drink but my two friends had food. One of them ordered the pancakes with ice cream, they came promptly (with yoghurt) but she couldn't cut them (?) with her knife so sent them back saying that she would just have a drink instead. She then waited more than 15 minutes for a coffee, during which time another order of pancakes was sent out to her (?). The raisin toast my other friend ordered looked great, nice thick slices. aka Fannie Bay Super Pizza. I went last night. I had the tagliatelle napoletana and my friend had the meat canneloni. We also had garlic bread. The food here is really good! I now I've unrepentantly whinged many times about the $1.50 "service charge" for dining in and some of the crazy antics/attitude of some staff there, but lord the food is GOOD! The pasta is really fresh and the sauces light but flavoursome. I'm pretty sure there was a hiatus in conversation for a good 10 minutes while we ate! On this occasion there were no orders being taken in the restaurant for pizza as one of the ovens was down and they were flying just to keep up with take away orders. AMBIENCE: 8/10 - I like the red and white checked table cloths and the glass-fronted frames full of business cards. Not too brightly lit - casual, but welcome to stay a while. Thanks for the tip Jeannie! Click on the photo to get recipes of the yummy dishes pictured and visit other foodie blogs. The Sand Bar, for those who haven't visited, is a lovely cocktail bar with a view of the ocean in the Skycity Casino. It's popular with those who like to dress up for a night out and has a very impressive cocktail list. It has lots of lounging couches and boasts three organza-curtained booths that you can book if you want a tab for the evening, your own personal waitress and you don't want to dance in a circle around your bags (not just an 80s phenomenon!). I went there last night, my workmates and I booked a booth - $250 with a $150 tab included. While this place is not technically an eating place, they do provide pizzas from Il Piatto. We shared two of the "italia" pizzas and they were really good. The crust was crisp an light and all of the toppings were full of flavour. The cheese was good quality too - not too salty or greasy. Delicious food to go with an evening of cocktails and champagne! Fond farewell to Kyrie! We'll miss you, see you again sometime!